As they say in football, play to the whistle. 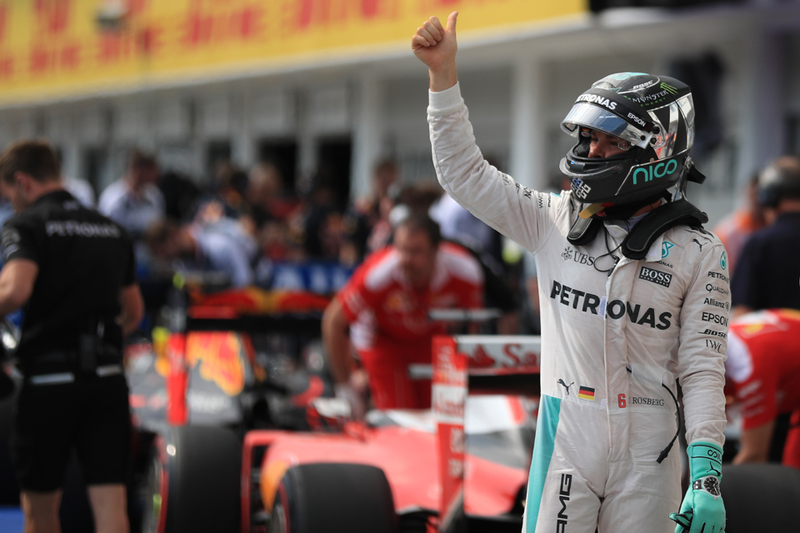 Nico Rosberg played to the whistle in today's extended, fragmented and madcap Hungarian Grand Prix qualifying session, and as his reward fired in a last minute winner. One rather against the run of play too. To borrow from the great John Arlott, a man who did football commentaries occasionally indeed, it was a strike so late so as to be positively posthumous. Pole, which had looked too far from his grasp, is his. That is the bottom line, but boy did we have some adventure and counter-adventure in getting there. The strange way pole was won therefore had a certain aptness. In a sport not short of crazy, interrupted and extended qualifying sessions it is genuinely difficult to cite one from the past that was quite as extreme in all three as today's. It had started with something like a deluge commencing around 45 minutes prior to qualifying's scheduled start, and which was continuing with something like the same intensity both as that intended and the actual start times arrived. The first part of quali alone indeed took a whole 74 minutes thanks to rain delays and various stoppages due to the weather and accidents - almost as long as a Monza race... Even when the track became good for slicks the odd puddle and alternative hazard lingered. Yet to cut a very long story short (one that one observer compared to War and Peace), Lewis Hamilton - a man who usually has the Hungaroring to himself - looked like he would again. A crash on Friday had threatened to lose him momentum and indeed this morning in practice he was nowhere. In a wet-to-dry qualifying too with times typically tumbling Lewis dodged a bullet by messing up his final Q2 effort and he only just survived by a tenth. But come Q3 it looked like normality was finally being restored. Lewis was on top, and then on his final run his pole looked assured as his first sector time glowed purple and was an amazing four tenths quicker than Nico's, his nominal closest challenger. 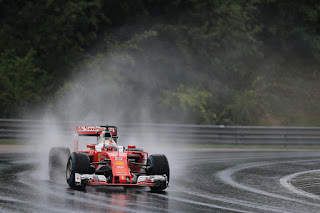 That was until Fernando Alonso found one of the lingering wet patches on the road and spun on it. Lewis was the first on the scene, slammed on the anchors at the sight of the broadside McLaren and abandoned his effort, as indeed did many others at the double-waved yellow flags. 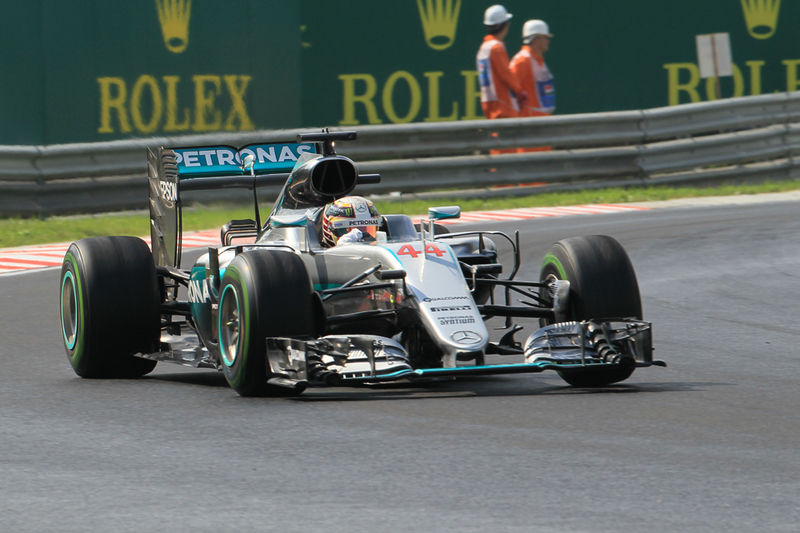 Most assumed that quali was being ended in effect ahead of time and pole was Lewis's. That was until we discovered the importance of playing to the whistle, which is where we came in. Almost alone it seemed Nico kept his foot in when others lifted theirs and upon crossing the line he pipped Lewis by around a tenth and a half to ensure it is he that starts from the front tomorrow. A crazy and prolonged day had a final sting. 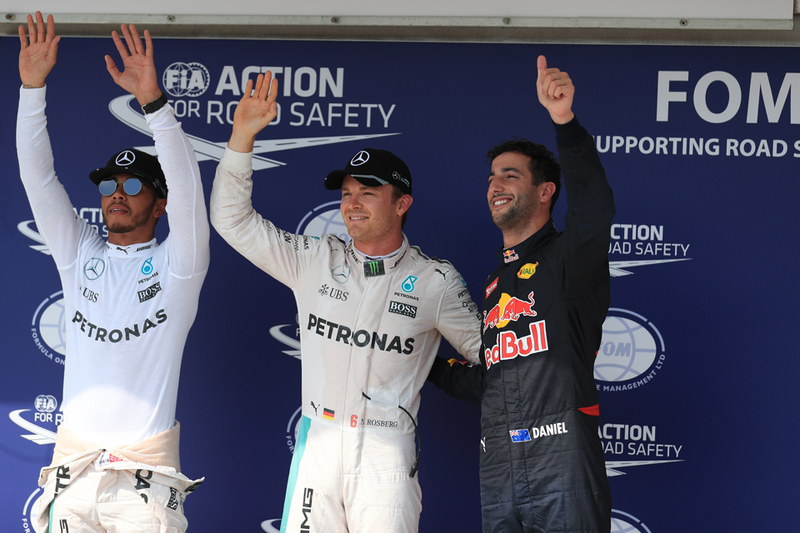 Plenty pointed out the irony of Alonso blocking Hamilton to deny him pole in Hungary. Perhaps they'll get around as well to talking about Nico getting a pole over Lewis thanks to a yellow flag. But the end result is the same. There was the odd slightly desperate accusation afterwards as to whether what Nico had done through the yellow flag zone was kosher, but replays shows that Nico made a clear lift from the throttle so appears above board without question - as we found out with Nico Hulkenberg in Austria whether you lift at all is the crucial point. The extent of the lift doesn't really come into it. Rosberg, given Fernando had cleared from the racing line by the time he got there, simply benefited from this particular cookie's crumble. And if ever there's a track that you'd gladly accept pole, any pole, 'lucky' or not, then Hungary would be somewhere near the top of the list. To think too that Nico muttered something in advance of this weekend about the things going his team mate's way couldn't go on forever. Well his maxim was proved right today. And the shift was emphatic. "Yeah it was a really challenging qualifying" said Nico afterwards, if anything understating matters. "Conditions changing all the time, very exciting out there. In the end it was pretty amazing that it did fully dry out towards the end. Some kerbs still had some patches like going onto the start-finish straight and you had to be careful opening DRS, you saw a lot of moments going onto there. Then yeah I got a really good lap in on my last lap, so awesome, very happy with that." Lewis, despite his misfortune, was sanguine outwardly though. "I felt good on that [final] lap" he said. "A bit unfortunate with Fernando, but these things happen. I'm not too disappointed, it was a tricky session and I did the best I could do. "We still have a long race ahead of us tomorrow so I'll give it everything I've got from there." After a Friday on which it looked like the Mercs would run away today the Red Bulls joined the party, as they had been anticipated to do prior to the weekend. They looked capable throughout of getting among the Mercs, and even with the usual Merc trick of 'turning up their engines' for qualifying Daniel Ricciardo's best mark was within a couple of tenths of Lewis's and good for P3. He was less sanguine than Lewis was with qualifying's early conclusion of sorts however. "We got hurt by the yellow as well" said the Australian. "I was pretty angry on that last lap because I was up a bit and I think it would have put me closer to pole. It would have been interesting without a yellow. I'm a little disappointed because it's a 'maybe what could have been'. "But at the same time I think the session went really well. I think in all conditions we were competitive. It was crazy, you had to adapt quickly, when to go onto slicks I think it was in Q2. Even just the little things like getting out of pit lane on the slick tyre when it was so wet, sideways coming into turn 1. It was fun. It was challenging. On the last corner in Q3, there was still a little bit of wet patch just next to the kerb, it sort of sucked me in as I opened DRS as well. I was in for a little bit of a ride, but in the end, survived!" Max Verstappen in the other Red Bull starts next up, albeit with a time close to three tenths off Ricciardo's and he was another to dodge a bullet today as in trying to clear some space for himself before his final flier he managed to not get over the line before time up... It didn't cost him anything as it transpired though. After that we have Sebastian Vettel. 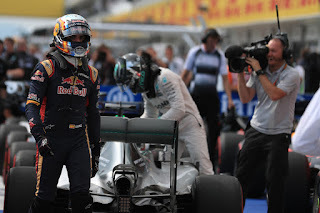 It felt about right given he rarely appeared quite with the Mercs and Bulls today, though he insisted that his starting number and his nine-tenth gap to the front would both have been less but for everything else that was going on. "I don't think it's fair" he said of his final outcome, "we had a yellow in the end and then Jenson [Button], I don't know why, he didn't move out of the way [at the end], so I couldn't close the lap, I lost a lot of time...I think he was sleeping, I think he didn't expect anyone to keep going. "Otherwise I think we could have been top 3 easy. Bit of a shame, the car felt very good. We did some changes after FP3 and I think they worked". He added later that he thinks he can fight for the podium tomorrow. As for Kimi Raikkonen it was even worse as he dropped out in Q2 and will start in P14, a case where he'd topped the times briefly just before the end only to drop like a stone as others improved on the drying track. All in it seemed another bewildering and underwhelming day for the Scuderia. It strikes that we're getting positively used to excellent performances from Carlos Sainz, and today was the scene of another, him bagging P6 on the grid. And it's ironic too that many will associate Alonso's day primarily with his final boo-boo, as he was mighty throughout in wet and dry and the P7 he got is a fitting reward. Jenson Button next up ensured that it was the first time both McLaren-Hondas got into Q3 since the famous team and engine partnership got the band back together. As for tomorrow at the very front, Lewis you suspect is quicker of the two Mercs but his options to vault Nico seem limited - overtaking in F1 is not easy at the best of times and is especially difficult at this track. Mercedes often is risk-averse and prone to give the lead car priority on strategy, which in large part leaves the start as Lewis's best chance. Further complicating matters, the Red Bulls are likely to be close at hand throughout. Nico felt confident though in a weekend wherein - unusually for him at this venue where he has never so much as got on the podium - cards have rather been falling his way so far. "I don't really think of the past in those ways" he insisted about the stat mentioned. "I'm just looking forward to it now. It's pole position. I've been feeling really good the whole weekend you know, in all conditions, wet, dry, even with high fuel on Friday. It's been a great weekend so far, so looking forward to the race and a great opportunity tomorrow." 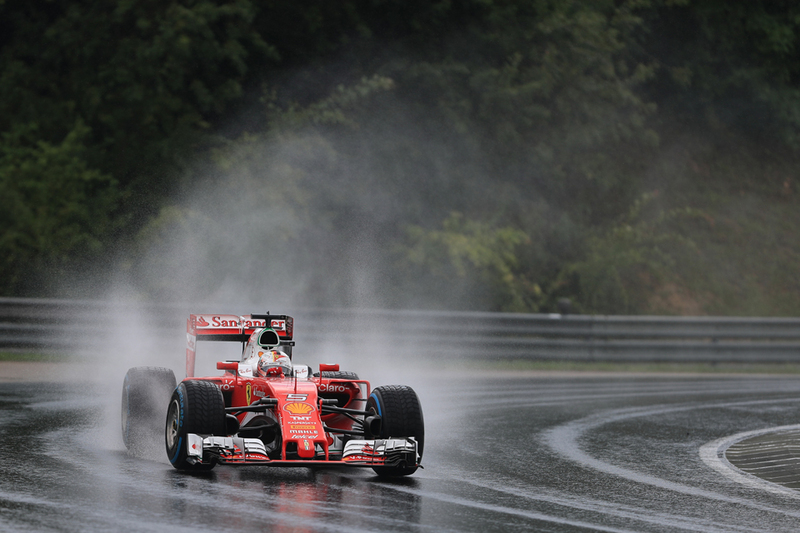 But even at the Hungaroring things can look very different very quickly. We saw that within metres of the start last season. And we saw it in an extreme sense today.